The smash hit that started it all! 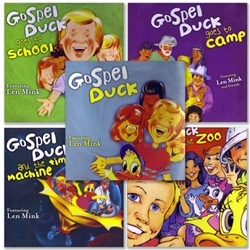 Meet Gospel Duck as he gives his life to the Lord and the children that lead him along the way. Songs include Dance Before The Lord, Little Person In Jesus, Child Of The King, Don't Be Afraid, Come On And Smile, God Is Good, Praise Medley and I Love To Be A Duck For Jesus. Another exciting journey with Gospel Duck, Len Mink and all of their friends - this time at summer camp! Songs include You'll Love It, Use Your Faith, Water, Veggies, Camp Silverwood Theme, Forgiveness, It's God, Feed Your Faith, I Praise You Lord, Wish You Were Here, I Want To Be Your Friend, Think On These Things, Camp Silverwood March and Salvation Prayer. Lions, birds, monkeys, elephants - experience all of these animals and more as Gospel Duck leads an exciting expedition to the zoo! Songs include We're Going To The Zoo, Think Big Like God, Laughter Does Ya Good, I Will Pray For You, Friendship, Be Bold As A Lion, Rodney's Rap-Sody, Dusty's Song and Heads Above The Rest. Venture back in time with Gospel Duck, Len Mink and the children as they witness scenes from the Bible. Songs include I Wish I Could Have Been There, T.I.M.E., Lord Take Us Back, God Made It All, Out Of Egypt, Precious Little Baby, Loaves And Fishes, Zacchaeus, It Should Have Been Me and Back Home Where We Belong.